How do you give a conference presentation when your laptop with the presentation on it dies 1 hour before the presentation? You tweet it. Graeme Earl is co-investigator with the DataPool Project. 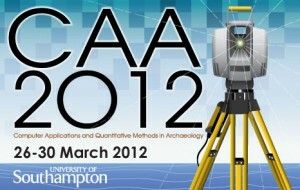 He is also a senior lecturer in archaeology at the University of Southampton and organiser of the Computer Applications and Quantitative Methods in Archaeology 2012 (CAA2012) conference being held in Southampton this week (26-30 March). So this is an especially busy time for Graeme, yet he still wanted to give a presentation on DataPool to his own research community. In case Graeme hasn’t time to blog his presentation as well, we’ll do it for him. Twitter is intended to be an immediate service so retrieval can get harder over time. You may be able to find the original tweets by searching for Graeme’s username or for the hashtags he used. To avoid repetition these have been removed from the tweets and are copied immediately below. There is also some brief annotation of links between tweets to assist readers. Otherwise, tweets are as Graeme’s originals. For reference, the presentation was given around 5 pm on Wednesday 28th March. Report on Developing Institutional Research Data Management Policies, a JISC Managing Research Data (MRD) Programme meeting held in Leeds on 12-13 March. Research data management infrastructure projects (RDMI), Web page on the first phase of the JISC MRD programme. JISC project page for IDMB: Institutional data management blueprint, predecessor project to DataPool. DataPool poster paper, on Graeme’s Slideshare account. JISC project page for SWORD-ARM: SWORD & Archaeological Research data Management. > Publication – push to and pull from external repositories e.g. ADS; policy implications for this? Portus Project, Digital Humanities, University of Southampton. A project for the research life cycle? DataPool blog post, 8 March 2012. Computationally Intensive Imaging, University Strategic Research Groups (USRGs), University of Southampton. Data system, policy, training: putting people first, DataPool blog post, December 8th, 2011. Digital Economy USRG, University of Southampton. Data management plans (DMPs): the day has arrived, DataPool blog post, 22 March 2012. Agenda for JISC workshop on Meeting (Disciplinary) Challenges in Research Data Management Planning held in London on 23 March. > @PatHadley thankfully I had a helper to advance them for me! That’s it: presented, tweeted, now blogged.